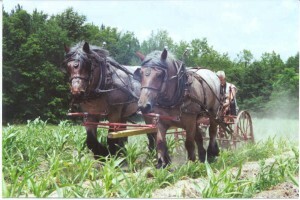 The Brabant draft horse is the foundation horse for the American Belgian. Until about 1940, the Brabant and the American Belgian were essentially the same horse. After World War II the Brabant was bred in Europe to be thicker bodied and more drafty, with heavy feathering on the legs, while in the United States the Belgian was bred to be taller, lighter bodied and clean legged. ^ Stallion Scout (75%) on the offside and mare Mabel (87%) in lead owned by Karen Gruner of Ijamsville, MD, rake hay. 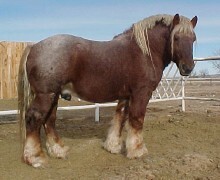 Both horses are bay roans. Bay roan comes in a variety of shades. The Brabant is raised in several European countries and goes by different names, depending on the country of origin. In southern Belgium, the Brabant is called the Cheval de trait Belge or Brabançon. In northern Belgium, the Brabant is called the Belgisch Trekpaard. In France it is the cheval Trait du Nord, and in Holland it is the Nederland Trekpaard.  The Brabant is also raised in Denmark, Luxembourg and Germany. ^ Stallion Rocky (100% Brabant) and mare Bulah (75%), both bay roans bred in the U.S. from Milkwood Farms stock by Eros van't Berrekenshof, owned by Tommy Flowers of Blackville, SC. The modern Brabant has a deep, close-coupled body with a short thick neck, a massive but neat head, and plenty of bone in the legs. The typical height range is 15.2 hand high to 17 hh. The Brabant is an easy keeper with a quiet, gentle, willing disposition, making it an ideal breed for the small farmer interested in sustainable agriculture. The modern Brabant is a true draft horse. ^ Showing the Brabant's versatility are a pair of U.S. bred 100% Brabant mares (lead is bay roan, off is blue roan), owned by Alan Quimby of MT. Unlike the American Belgian, the Brabant comes in many colors. The most common colors are red bay and bay roan. Also seen are dark bay (brown), blue roan, black (rare), sorrel, strawberry roan and even gray (rare). 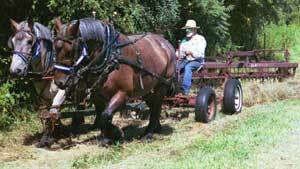 The American Brabant Association exists to preserve and promote the Brabant (European Belgian) draft horse in the United States and Canada. The membership fee is $25 per year and includes two newsletters and two smaller mailings. Our January newsletter includes the member-breeder list and a pictorial stallion parade. Our July newsletter focuses on spring foals and farm work and logging with Brabants. Newsletters also contain articles of interest to the draft horse enthusiast, like starting the young horse, health issues such as vaccination and worming, and news from Europe. Joining is as easy as filling out our print-and mail Membership Form. Won't you join us?